Type 7801 PVC Discharge Hose is an economical yet durable lay-flat PVC hose for contractor pump discharge and water transfer applications. 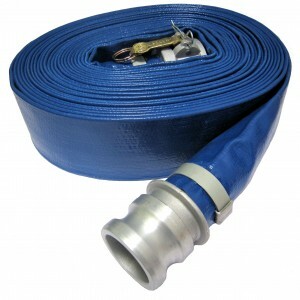 This discharge hose is available in a broad range of stocked sizes, assembled or in bulk rolls. The co-extruded hose design will not de-laminate like many bonded lesser quality hoses. This abrasion resistant hose wall with 3-ply textile reinforcement will hold up to heavy use. Type 7801 PVC discharge hose is formulated for pump rental, general contractor, and agricultural open flow discharge applications. Most sizes are available in up to 300 foot continuous rolls. 100 Foot rolls and cut lengths are available. Made in USA (most sizes). A heavier grade version is available in 4, 10 and 12 inch diameters (Full rolls only).